Create your own music inspired by minimalist composer Steve Reich! Pulitzer-prize winner Steve Reich has been called “America’s greatest living composer” (the Village Voice). Third Coast Percussion released a new album of Reich’s music in 2016 to celebrate the composer’s 80th birthday, and created this app to give audiences a new way to engage with this amazing music. Currently available for iOS. Android version coming soon! Create your own musical content by recording sounds, building your own musical patterns, altering playback speed, “phase-shifting” a pattern against itself, and more. Share your musical creations via social media or e-mail. Explore minimalism with 3 different activities based on concepts from Steve Reich’s music. Listen to excerpts from Third Coast Percussion’s new album or buy the album. The year 2012 marks the 100th anniversary of Cage’s birth. Musicians, artists, and fans around the world are celebrating this momentous occasion. 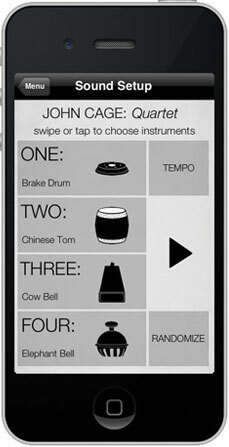 We designed this iPhone app with our friend Joseph Genden to give everyone a chance to perform Cage’s music. 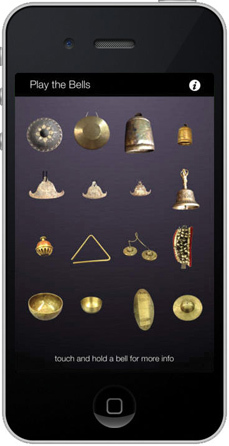 This free iPhone app explores the many bells used in Augusta Read Thomas’s Resounding Earth. Bells are indigenous to countless cultures spanning the globe. They can be used to celebrate grand occasions, hold sacrificial rites, keep a record of events, give the correct time, celebrate births and weddings, mark funerals, caution a community, enhance any number of religious ceremonies, and are even hung around the necks of animals. In 2012, renowned composer Augusta Read Thomas wrote a new piece of music entitled Resounding Earth for Third Coast Percussion, scored for over 125 bells from all over the world. Third Coast Percussion released a CD/DVD of Resounding Earth on New Focus Recordings, and now this free app, designed by Joseph Genden, gives users a virtual opportunity to play the bells themselves. Grammy-award winner Augusta Read Thomas was Mead Composer-in-Residence with the Chicago Symphony from 1997-2006. Her piece Astral Canticle was one of two finalists for the 2007 Pulitzer Prize. Thomas was elected to the American Academy of Arts and Letters in 2009, she has been on the American Music Center Board since 2000, and she is the 16th ever University Professor (of five current University Professors) at The University of Chicago. Sampled sounds from sixteen different bells used in Resounding Earth. Information on the origins and cultural significance of the different bells. Tap any of the bells to play them, or hold your finger on a bell to learn more about it.